The Big Data Hadoop Architect Master's Program transforms you into a qualified Hadoop Architect. This data architect certification lets you master various aspects of Hadoop, including real-time processing using Spark and NoSQL database technology and other Big Data technologies such as Storm, Kafka and Impala. 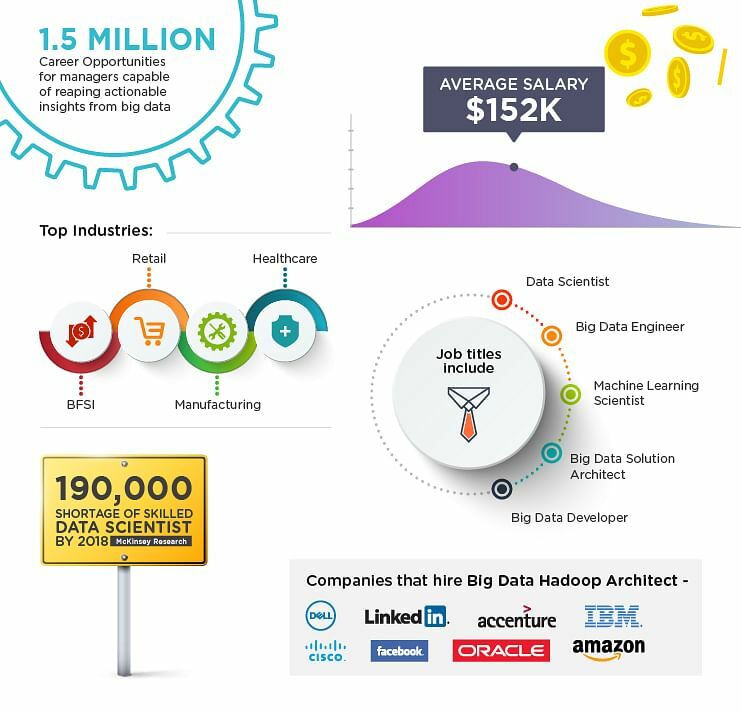 Big Data Hadoop architects are among the highest paid professionals in the IT industry. 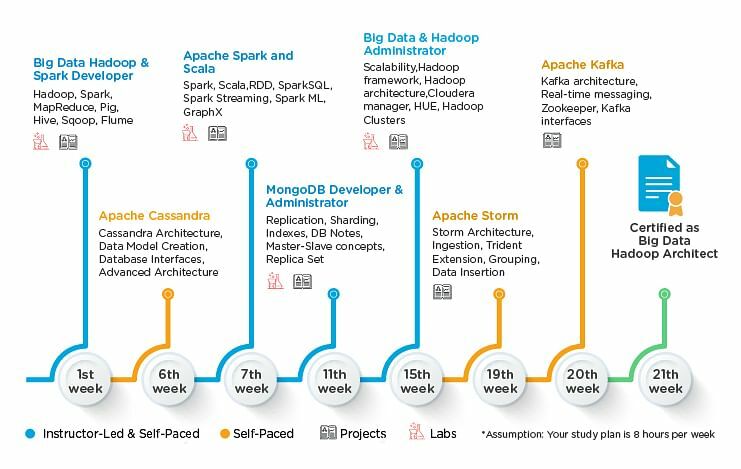 Simplilearn’s Big Data Hadoop Architect Masters Program will help you master skills and tools like Cassandra Architecture, Data Model Creation, Database Interfaces, Advanced Architecture, Spark, Scala, RDD, SparkSQL, Spark Streaming, Spark ML,GraphX, Replication, Sharding, Scalability, Hadoop clusters, Storm Architecture, Ingestion, Zookeeper and Kafka Architecture. These skills will help you prepare for the role of a Big Data Hadoop architect. Why become a Big Data Hadoop Architect? In addition to being responsible for planning and designing next-generation Big Data systems, Hadoop architects also manage large-scale development and deployment of Hadoop applications. Big Data Hadoop Architects have become the critical link between business and technology. Description: Your company wants to set up a new cluster and has procured new machines; however, setting up clusters on new machines will take time. Meanwhile, your company wants you to set up a new cluster on the same set of machines and start testing the new cluster’s working and applications. Project 2: Understand how companies like Facebook, Amazon, Flipkart leverage on Big Data Clusters using the below case study. Project 3: See how banks like Citigroup, Bank of America, ICICI, HDFC make use of Big Data to stay ahead of the competition. Project 4: Learn how Telecom giants like AT&T, Vodafone, Airtel make use of Big Data by working on a real-life project based on telecommunication. Project 5: Understand how entertainment companies like Netflix, Amazon Prime leverage on Big Data. Description: US-based university has collected datasets which represent reviews of movies from multiple reviewers as a part of Research Project. To gain in-depth insights from research data collected you have to perform a series of tasks in Spark on the dataset provided. Project 6: Learn how E-Learning companies like Simplilearn, Lynda, Pluralsight make use of NoSQL and Big Data technology. What type of jobs are ideal for Big Data trained professionals? The learning path ensures that the participants master the various components of Hadoop ecosystem, such as Hadoop 2.7, MapReduce, Pig, Hive, Impala, HBase, Sqoop etc., and learn real-time processing in Spark, Spark SQL, Spark streaming, GraphX programming, and Shell scripting spark. The Data architect certification course also includes NoSQL database technology such as Cassandra & MongoDB, and as electives Storm, Impala, and Kafka, which are additional skill sets to ensure you become a Hadoop champion. Big Data Hadoop and Spark Developer Certification Training Hadoop and its ecosystem Master the various components of Hadoop ecosystem like Hadoop 2.7, Yarn, MapReduce, Pig, Hive, Impala, HBase, Sqoop, Flume, and Apache Spark. The course is aligned to Cloudera CCA175 certification. Apache Spark and Scala Certification Training Spark and Scala Master the essential skills in Apache Spark & Scala such as real-time processing, Spark SQL, Spark streaming, machine learning programming, GraphX programming, and Shell scripting spark. MongoDB Developer and Administrator Certification Training MongoDB Learn to become an expert MongoDB developer and administrator by gaining an in-depth knowledge of NoSQL and mastering skills of data modeling, ingestion, query, sharding, and data replication. Impala Certification Training Impala Learn the basic concepts of Massively Parallel Processing (MPP) SQL query. It provides an in-depth understanding of querying in Hive and Impala, including Impala architecture, daemon, statestore, and catalog service. Apache Storm Certification Training Storm Master the concepts of Apache Storm including its architecture, planning, installation, and configuration. You will learn to use Storm for real-time processing and understand how Storm interfaces with Kafka, Java, and Cassandra. Apache Kafka Certification Training Kafka Master the components of Kafka including its architecture, installation, interfaces, and configuration. It includes basics of ZooKeeper and how to use Kafka for real-time messaging. Big-Data and Hadoop Administrator Hadoop framework, HDFS, and Hadoop cluster The course provides a detailed overview of Hadoop framework, Core Hadoop distributions —Apache Hadoop and Vendor specific distribution—CDH (Cloudera Distribution of Hadoop) and also imparts knowledge about the need for cluster management solutions, Cloudera manager, and its capabilities. Apache Cassandra Certification Training Cassandra Understand the basic concepts of Cassandra including its features, architecture, data model, and Hadoop Ecosystem products around it. You will learn to install, configure, and monitor Cassandra. I enrolled in the Big Data Hadoop Architect Program at Simplilearn. The sessions are comprehensive, well-planned and the reading material provided is exceptionally good. The trainers are marvelous as they explain every concept in detail with ease. The Cloudlab feature provided is an excellent platform for anyone looking to get hands-on experience as you can access it 24*7. Keep the good work going, Simplilearn! I enrolled in Big Data Hadoop Master Program and the experience so far has been very satisfying because the course content is present in a crisp and concise manner. The instructors have up to date knowledge of the subject and teach concepts effectively. The hands-on experience obtained due to cloud labs is one of the many commendable aspects which Simplilean offers. I also plan to take up the Data Scientist Masters’ Program. Thanks, Simplilearn for all your support! I was a Java developer before I enrolled for Simplilearn’s Big Data Hadoop Architect Masters program. The course has given me the confidence to switch to the Big Data field. I am now a data engineer and the job entitles me to a higher pay when compared with my previous role. I was an apprentice trainee in embedded systems before I enrolled for Simplilearn’s Big Data Hadoop Architect Masters program. This training helped me qualify for a developer’s role in the Big Data domain. Thank you Simplilearn. Ravindra Kumar Data Analyst at First American India Pvt. Ltd. I completed Big Data Certification Training from Simplilearn. The course syllabus and training materials were very detailed and basic concepts were explained in a very simple way. They covered almost all topics which helped me to complete my projects. Because of this course, I gained more confidence in the analytics domain. It also helped me in shaping my career from Senior Data Analyst to Tech Lead. Thanks Simplilearn. I completed the Big Data Hadoop Architect course from Simplilearn. The course syllabus and training materials were very detailed, and all the basic concepts were explained well by the experts. It was beneficial and paved the way for a role change from a Senior Software Engineer to Senior Java Hadoop Developer in my current organization as well as a 30% hike in salary. It helped me continue my career in Technical Operations with technologies like Data Science, AWS, etc. I enrolled for Simplilearn's Big Data Hadoop Architect Master’s Program. By the end of the program, my knowledge and skills on Hadoop Development had increased, and my career graph took off in a vertical line. I received an unexpected 15% increment in my salary and plenty of job opportunities. Simplilearn is one of the best platforms to learn and upscale your career. It's Big Data Hadoop Architect certification boosted up my level of knowledge in Hadoop and Analytics and helped me to boost career from Lead Consultant to Practice Lead in my present organisation. Thanks to Simplilearn for the making my learning experience knowledgeable. I have taken up Big Data and Hadoop Masters course and the learning experience so far has been great. The trainers who conduct the classes are exceptionally good as they have sound knowledge of the subject. Their approach towards teaching the subject is unique as even the complex concepts become easy to understand. Customer service has also been wonderful and any complaints are addressed quickly. The access to the lab is easy and seamless. Keep up the good work, Simplilearn! I love these guys! I've taken two courses from them already and I have now enrolled in the Master Program Big Data Architect. Their customer service, Learning Management System (LMS), course content, and cloud labs are the best in the e-learning market. I highly recommend Simplilearn! I completed my Big Data Architect certification from Simplilearn. The content was helpful and easy to understand. The most convenient part of learning from Simplilearn was I could do the certification from the comfort of my home. Overall I am totally happy with the platform. learning path that will empower you to become a qualified data scientist. What will I get along with the Masters Program? Who can be a Big Data Hadoop Architect? How do I earn the Master's Program certificate? On completion of the following requirements, you will be eligible to receive the Master's Program certificate that will testify to your acquisition of a Big Data Hadoop Architect’s skill set. For the elective courses, course completion certificate and project certificate are not required. Are the training and course material effective in preparing me for the Big Data Certification exam? Yes, Simplilearn’s training and course materials guarantee success with the Big Data certification exam.